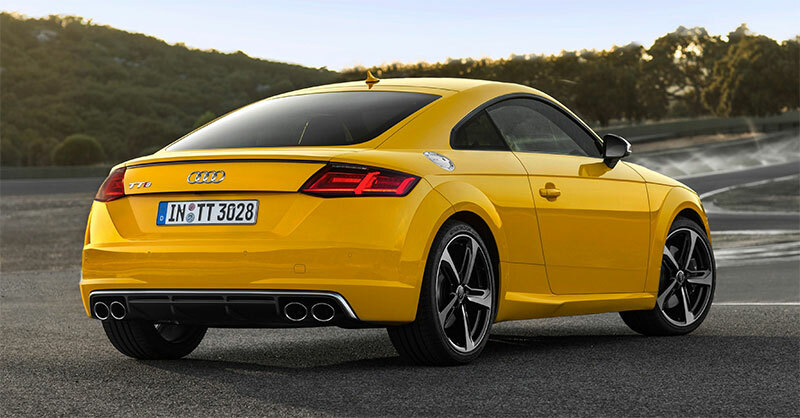 Audi today announced pricing for the all-new 2016 Audi TT model line. The iconic vehicle boasts an exciting new design characterized by the use of innovative technologies and driver-focused performance. The third generation TT pays tribute to its past where the model took the design world by storm, with a modern take on the bold original, with short overhangs, broad wheel arches and a lean a muscular stance. Standard full LED headlamps exude modern sports car appeal, with a broader and flatter Singleframe® grille, sharp contours across the hood, electric rear spoiler and new centrally mounted round exhaust tailpipes are an incorporated design cue from the iconic first generation model . The all-new TT front end and floor assembly are made of high-strength and ultra-high-strength steel components, while the superstructure comprises aluminum castings, extruded sections and panels. As with all Audi S models, the TTS receives additional differentiation that includes unique front bumper, quad exhaust tips and Alu-optic mirrors as well as standard S model specific sport seats with pneumatic side bolsters on the interior to mention a few. The TTS also boasts 19-inch wheels and 13.3 inch front brakes with four-piston aluminum monobloc front calipers. The S model design elements paired with the powerful engine and the standard magnetic ride suspension make the TTS a true performance car for everyday use. TT is available in 10 different color options, including two specific TTS colors, Daytona Gray and Sepang Blue. On both TT and TTS, the models maintain the iconic Alu-optic fuel cap with exposed bolts, reminiscent of the first generation Audi TT, and now offers capless refueling. Also available for 2016 is the Launch Edition TTS, boasting a Mythos Black exterior, Express Red Fine Nappa leather interior, exclusive 19-inch five-arm facet design forged wheels, Piano Black decorative inlays, and an extended leather package which includes a leather wrapped airbag cap and instrument cluster hood. Production for the Launch Edition TTS will be limited to 75 units. New HVAC controls eliminate the need for a conventional dash console and integrate fan speed, air vent selection and temperature directly into the center of the three central vents, further underlining the clean, uncluttered design of the interior. Controls for the standard heated seat controls are also integrated in the side air vents further eliminating buttons and switches from the interior. An available Bang & Olufsen® Sound System with 680 watts features 5.1 Surround Sound, a 14-channel amplifier and 12 loudspeakers provides a stunning sonic experience. LED accent lighting surrounding the front door mounted speakers add to the interior ambiance. The Audi TT revolutionizes the way the driver interacts with the vehicle through the innovative virtual cockpit. An entirely digital instrument cluster, the virtual cockpit replaces traditional gauges and interfaces for a customizable driving experience. Unveiled at the 2015 Consumer Electronic Show, the virtual cockpit combines the functions of a central MMI® system with a conventional instrument cluster in one unique, 12.3-inch 1440×540 pixel TFT display with superb 3D graphics and brilliant clarity. For seamless processing speed, the quadcore Tegra 30 processor from the Tegra 3 series from NVIDIA is utilized. With a processing speed of over one gigahertz, the four-core chip can work together with a special 3D graphics program to perform more than eight billion computing operations per second. The graphics processor generates 60 frames per second, helping ensure the needles of the speedometer, rev counter and navigation are displayed with absolute precision and move naturally without any lag. Google Earth™ maps appear across the entire virtual cockpit and resolve nearly instantaneously when zooming in and out or when making menu selections. The all-new Audi TT will also feature the most advanced version of Audi connect®, including picture navigation, read-aloud news headlines, Facebook® and Twitter® alerts, access to more than 7,000 Web radio stations, personalized RSS news feeds and more. Audi connect is powered by 4G LTE and includes an integrated Wi-Fi hotspot for passenger devices. A newly-designed MMI system streamlines the data entry process with an MMI Touch pad and MMI navigation plus with voice control for compatible devices. On the TT Roadster model, voice control is achieved through driver seatbelt mounted microphones. The Audi virtual cockpit can be fully controlled by the buttons on the multifunction steering wheel or via the MMI controls in the center console which includes the MMI touch pad integrated into the console’s rotary dial. TTS features a virtual cockpit “sport” display mode, which brings the tachometer and speedometer to the front and center of the display, and also includes a boost gauge and lap timer. With the selection of the available Technology package, additional equipment is added including Audi MMI navigation plus, Audi connect® with online services, Auto-dimming / power-folding heated exterior mirrors, Parking system plus (front / rear acoustic sensors) with rearview camera, and Audi side assist. 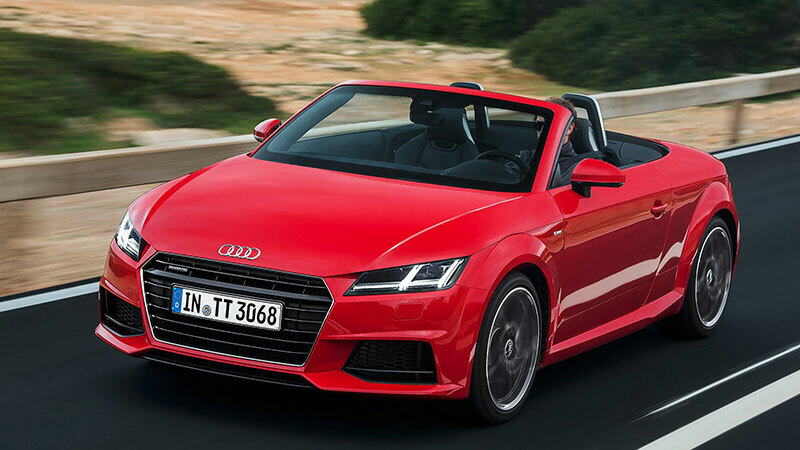 The Audi TT Coupe and Roadster will feature a 2.0L TFSI® engine with 220 hp and 258 lb-ft of torque for a 0-60 time of 5.3 seconds (coupe) and 5.6 seconds (roadster). The performance tuned Audi TTS Coupe will feature a 2.0L TFSI engine with 292 hp and 280 lb-ft of torque for a 0-60 time of 4.6 seconds. All models offer standard Audi drive select and quattro® permanent all-wheel drive for exceptional dynamics, excellent traction and superb grip. In its first application, the Audi drive select system on the 2016 TT now allows the driver to adjust the quattro all-wheel drive system, as well as the shift points, throttle response, steering, Taking this customization even further, on the TTS, the standard magnetic ride suspension may also be adjusted by selecting between dynamic, auto, comfort and individual modes. The quattro system has been specifically tuned for the TT & TTS to continuously shift power to the wheels that grip and has a rear-wheel bias when the Audi drive select is in the dynamic mode. The unique quattro calibration reads sensors 150 time every 10 milliseconds to optimally adjust power. This gives the quattro system the ability to shift up to 100% of power to the rear or the front axle when needed. The TT will be available as coupe and roadster, and the TTS will be available as a coupe only. All TT models are standard with quattro® all-wheel drive mated to a six-speed dual clutch S tronic® transmission that provides smooth, quick shifts. For more information on the 2016 Audi TT please visit www.audiusa.com.